Nu Beta at-Large Chapter member Rebekka Lerma is driven by the same force that drives most who work in the healthcare field, especially in the field of nursing: a passion to serve others. Her passion was formed early, and those life experiences mirrored those of the communities she would later feel called to serve. Rebekka Lerma grew up in Brawley, California, a small, rural community that bordered Mexico. Both of her parents had instilled the value of hard work and a strong work ethic within their daughter, and Rebekka entered the workforce at age 15. This first job happened to be in a medical office that offered OB/GYN services to primarily low-income women, and Rebekka knew she had found her calling. As it turns out, Johns Hopkins School of Nursing was able to help Rebekka ease that ache. She’ll earn her MSN in May 2019 and plans on continuing her education with the Johns Hopkins School of Nursing Family Nurse Practitioner doctorate program. Rebekka’s time as an MSN student has been enriched by many experiences, including opportunities to travel to rural communities in Guatemala with other nursing students and being a member of an interdisciplinary student team that focused on overcoming social barriers to health, as well as the opportunity to connect with others who share her passion. Interested in providing opportunities for more student nurses like Rebekka? 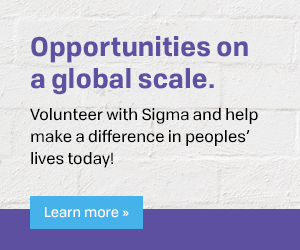 You can learn more various opportunities by contacting the Sigma Foundation for Nursing or visiting www.SigmaNursing.org/Foundation.